We all know Santa as the wise old guy who is filled with Christmas spirit who rides his reindeers into children’s houses to give them gifts. This game gives players a look into Santa’s life when it is not Christmas time. He is a biker who likes to have fun on his bike. So get ready to see Santa like you have never seen him before through this slot machine as he rides his bike, Santas Wild Ride. The game has a 243 ways to win format that are scattered across its five reels. 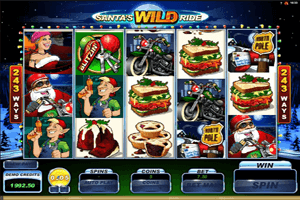 Play Santas Wild Ride Slot here. The game invites players to accompany Santa in his wild ride as they reap on the great rewards that the game has. The symbols that land on the game’s reels include beer ,Christmas cookies, sandwiches, Christmas desserts, Santa riding his bike, Santas Wild Ride, the road to the north pole, gifts, bike keys, Santa’s girlfriend and Santa’s Mechanic. Santa’s Wild Ride logo is the wild icon of the game, it will substitute all other non special symbols on the reels of the game. It will also multiply the payouts with a random multiplier. The video slot also comes with a free spins round that is activated by lucky players who get 3 or more bike keys on the reels of the game. They can earn up to twenty-five free spins.